There are some things that never stop being cute. Like babies and their first reactions to anything. No wonder YouTube is filled with babies reacting to everything from lemons, to rain, and snow. Though nothing, and we really mean nothing, prepared us for the feels we got from this latest baby video. Four-month old Leopold suffers from Oculocutaneous Albinism, which has severely affected his eyesight. Till date, he’d only felt his parents with his hands and never seen what they looked like. 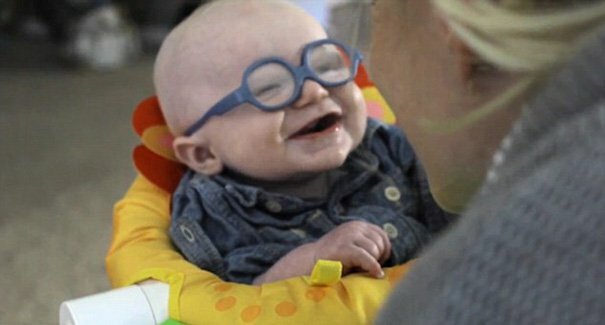 On 7th April, he was finally ready for infant glasses, and lucky for us, his family members captured Leo’s first visual interaction with his mother in this adorable video. BRB, too many feels. This video reminds us of another adorable infant and his reaction to hearing his mother’s voice for the first time. ICYMI, here’s more cuteness your way.